Living here in New York City with more than 5 million vehicles, it is a big headache to find a parking space. There are private commercial parking lots and garages which cost well above $30 per hour. Street parking, which is also paid parking, is much cheaper than commercial lots but is highly regulated and it is very hard to find a parking on street. Too many rules and regulations, timings and enforcement. A parking ticket can cost you from $55 to $100. In metro area, if you park wrong, you will not only get a fine but also a tow fee which runs in above $200, as your car will be towed away and you will be responsible for all the fees. If you don’t clear your car from impound within 7 days your car will be auctioned. So parking violations can put a dent on your wallet. 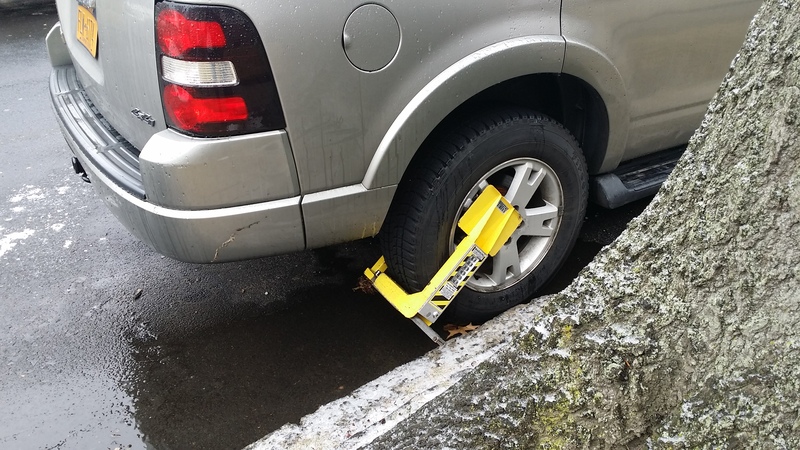 Traffic enforcement in Metropolitan cities like NYC, also use clamps to catch habitual violators with outstanding fines. Police patrol cars are fitted with Automatic License Plate Recognition system with up to date hot-list and while in patrol, if the violators plate is hit by a system, the cops stop to give citation in form of clamp/boot. 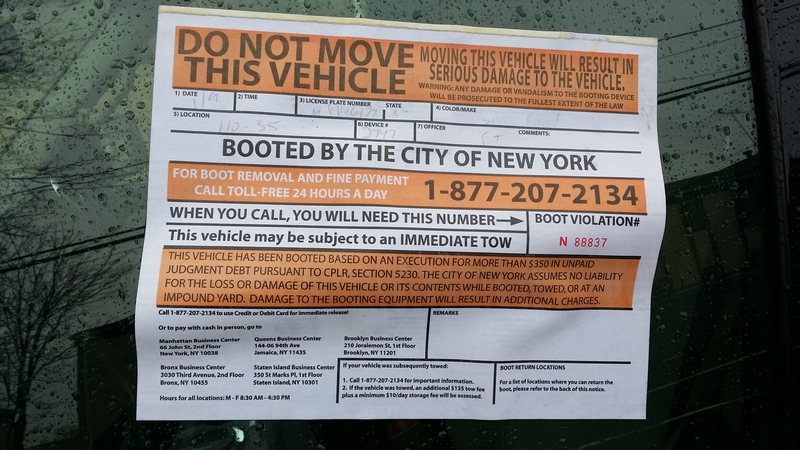 You can be booted/ clamped for owing the city more than $350 in parking, red light camera or bus lane violation tickets that are in judgment. To get the boot off, one need to call customer service representative with your debit/credit card number, clear all your outstanding fines including the boot/clamping fee. You will then receive a release code. Once you enter the code, the boot will unlock and you can remove it. You need to return the boot to a return location near you within 24 hours. Today, I came across a news clip and I was pleased that we are bringing in better systems of enforcement as well. Speed Radars to catch speeding drivers is already very actively in use to catch speedsters on our highways and motorways. Our cities are getting denser day by day and parking is also a big issue in our cities. We don’t have enough parking lots and our commercial markets and plazas hardly think about this major issue while designing new structures. Though some cities have parking lots but still not in enough numbers. Wrong Parking and parking at NO Parking signs is a very common scene and violators don’t even think for a second about the impact it can have on someone’s life. 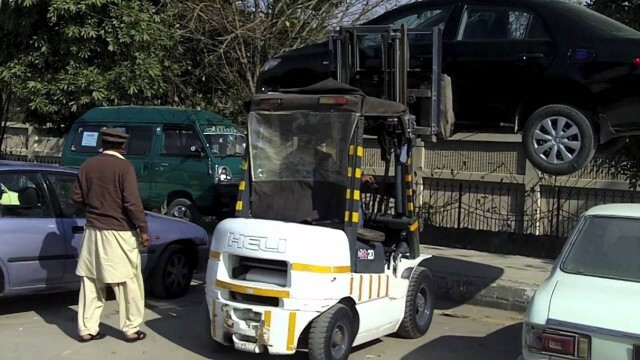 Traffic enforcement have been using fork lifts to lift the wrongly parked cars. 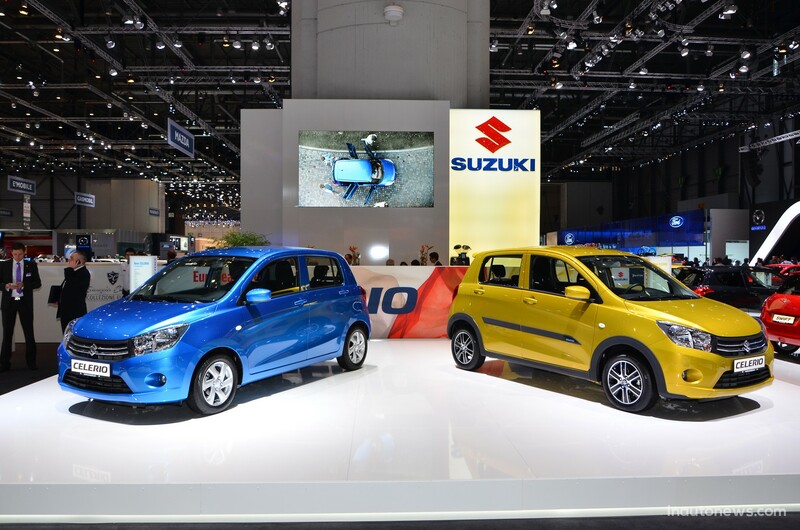 Though it clears the road but many people reported about damage to under carriage and dents or scratches to body panels. Looks like Traffic Police in Peshawar have came up with a better idea. Previously, with one fork lift in a certain area, it was difficult to enforce parking. Now if you park wrong, you will not be able to run until you pay for your violation. Traffic police will use clamps. 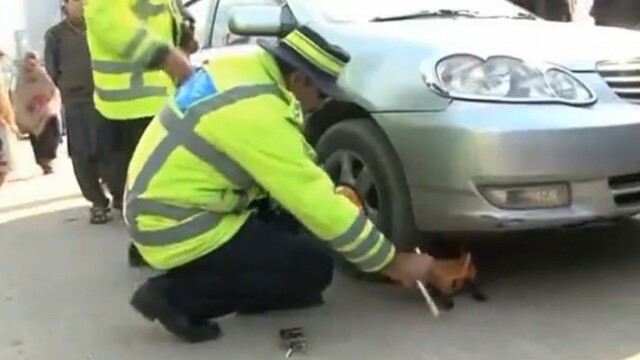 So in a certain area it will take less than a minute to clamp a car and many violators can be caught quite soon. I think we should appreciate new enforcement and must always obey parking signs. Your wrongly parked car can stop an emergency vehicle performing its duty. On the other hand, government should enforce city developers to add parking lots/ spots for the ease of public. It should also be mandatory for construction companies to have a large parking area which can cater to the visitors with ease because the builder create malls but give absolutely no damn about parking which clogs up the around the mall. Living on Rawalpindi outskirts where new Plazas are being constructed every few weeks by major roadsides, it is really shocking to see the owners would rather have more shops in the basements instead of offering some form of Parking. The results are simples, every new plaza brings a ton of cars parked in front of it which takes about 25% of the road on each side and a double sided roads is left like a single road with constant traffic jams. Wish our people planned a bit long term. A more high profile example is the newly rebuilt Ghakkar plaza where dozens died when the previous building collapsed due to very bad fire/exit planning.. This time they rebuilt the whole several hundred shops mall again but guess what… NO PARKING plan ..the basement is all shops. You’re welcome to clog the road on two sides of the plaza as the only option is to park in front on the road. At Least two parking floors should be mandatory.